Playa del Inglés is known as a great touristic zone. It was created in the 1960s and is the largest of the island of Gran Canaria. Here you'll find the Playa San Agustín beach to the east and the Maspalomas beach to the west. Playa del Inglés is almost 3 km long. Visitors can enjoy good weather almost all year. The tourist area is continually being renewed. Due to its popularity all over Europe, Playa del Inglés mixes all kinds of people and that, making it a very multicultural place. It's a favorite destination for families with children, naturists, newly married couples as well as groups of young people. It is also a gay and lesbian destination. As we see, it's an ideal destination for all types of travelers. It is very spacious, has sheltered parts and areas where children can play freely in a save surrouding. During the day, people enjoy the beach, sun and shopping. At night, a large range of restaurants, fast food restaurants, pubs, clubs and bars come to life, including British, German, Dutch and Scandinavian bars and restaurants. It's not a typical destination for sightseeing and cultural sites visits. 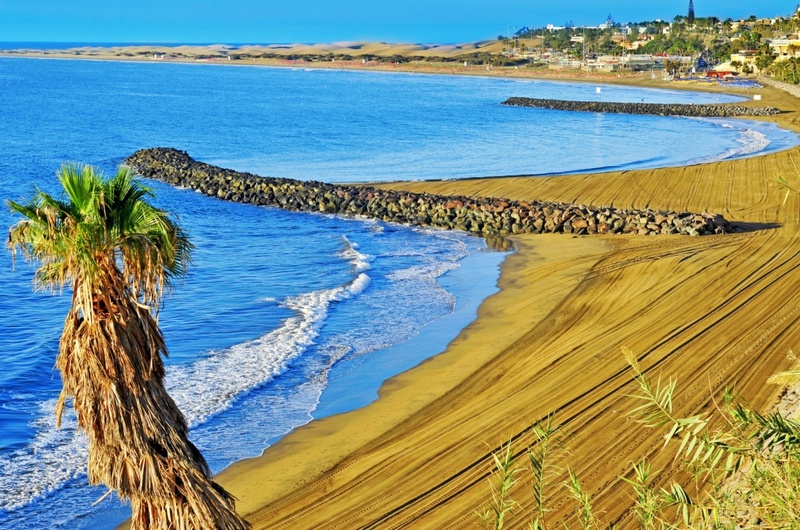 Should you get tired of the beach, one option is to walk along the Paseo Costa Canaria through the Playa de las Burras up to the dunes of Maspalomas. On this tour, you'll see the most luxurious villas of the area. Visitors can enjoy both the international and traditional cuisine of Gran Canaria. Near the beach, you can head to the Paseo Marítimo, a 2 km long promenade filled with many options to eat or drink something fresh.There are also large shopping centers like the Yumbo Centre, which is one of the best known because of the main events of the Carnival of Maspalomas that take place there. In these malls, you can find many international stores and buy anything you desire. Regarding accommodation, you'll find something for any budget and taste. There are apartments, bungalows, hotels in the three to five star category as well as adult only hotels, to ensure child-free tranquility, in case that's your priority. It is quite impossible to find a house without a pool here. The hotels offer all sorts of activities, amenities and wellness centers. In Playa del Inglés, golf lovers can spend their days in five luxury golf clubs: Maspalomas Golf Club Meloneras Golf, Salobre Golf and Resort, Golf Pitch & Put Anfitauro and Anfitauro Golf. It is also the kingdom for surfers. Playa del Inglés has also nudist areas. The's a great variety of sports and recreational activities, including jet skiing, sailing, windsurfing, water skiing and more. There are wheelchair ramps to access the beach. No matter what kind of visitor you are, Playa del Inglés has an option for you. For this and many more reasons, it's one of the most popular beaches of Gran Canaria. Find information about selected Hotels, apartments and rooms in Playa del Ingles to choose the perfect place for your accommodation.